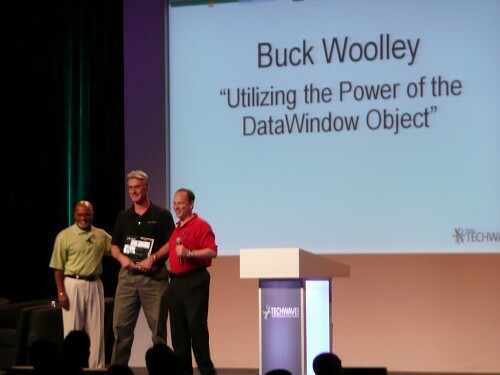 ISUG Journal Award, Utilizing the Power of the Datawindow Object. dw-eXtreme datawindow components were recognized at the 2005 Sybase Techwave conference as examples of the state of the art in datawindow technology. Read about the methods used in Powerbuilder Developers Journal. Download the Powerpoint presentation on Advanced Datawindow Presentation Techniques given to the Taiwan Powerbuilders Users Group in Nov. 2005. Dw-eXtreme develops sophisticated datawindow and datawindow.net based presentation components for the Powerbuilder, Pocketbuilder and .net communities. Our components harness the powerful presentation capabilities of the datawindow control, developed by Sybase, to create Extreme Datawindows. These capabilities help developers incorporate sophisticated graphical user displays that allow users to view and manipulate data in a more simple and intuitive manner. Extreme datawindow components are developed using only the Powerbuilder datawindow component and its native functionality and powerscript. No third party tools such as OCX controls or frameworks are used. All input and manipulation is intuitively mouse driven. This combined with the rich graphic presentation styles makes for a more enriching user experience. A variety of components are currently available that cover a number of business needs. 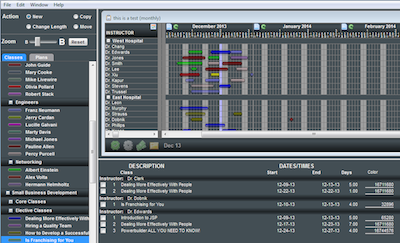 PB12.5 version of the Planner component demo available. Planner component (Demo) is used to display time based data associated with scheduling, project management and asset management in a variety of industries. 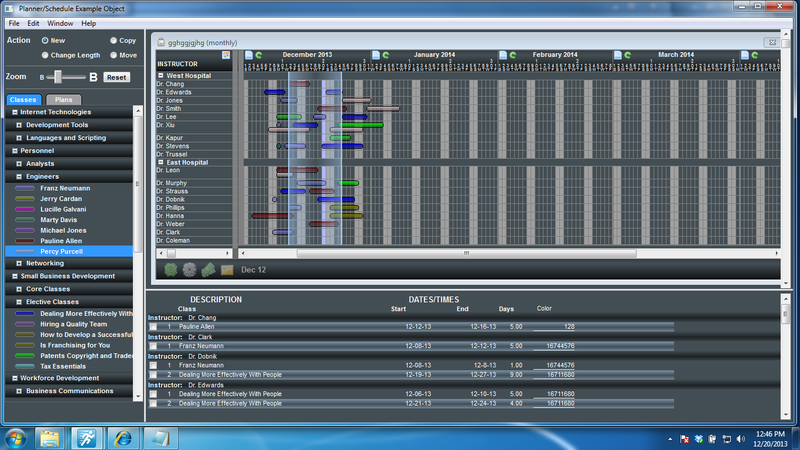 Data is displayed in a manner similar to a gantt chart. Planner v.2.0 extends the functionality of the planner component to the web. This version of the planner component is fully Appeon complient. The web version and the windows version of the planner are generated from the same Powerbuilder files and include identical functionality and appearance. Compare the browser version and the windows version. Please try the web version on the Appeon Demo website. To run the demo You must create an account with Appeon and configure your IE browser to the following security settings. Appointment component (Demo! 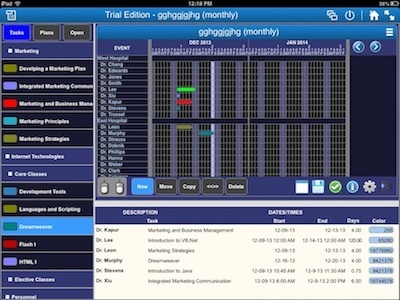 ), like the planner, is used to display time based data associated with scheduling, project management and appointments in a variety of industries. Data is displayed in a manner similar to the work week view in Microsoft Outlook calendar. Graphical Network editor (Demo!) is used to build networks or workflows from a variety of user defined node and and connections palettes. Workflow, schematic and network presentations can be visualized using the Graphical Network editor component. Org Chart builder (Demo!) enables the user to graphically generate a hierarchical chart from a user defined list simply using drag and drop technique. 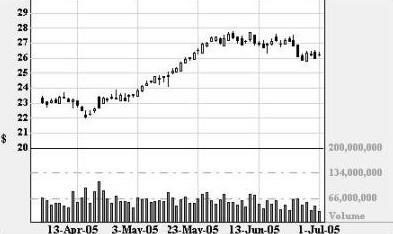 Stock Chart component is a stock charting component that displays stock price and volume information. Data can be displayed in a variety of formats such as candle, point and line charts. Each row on the datawindow displays the entire chart so multiple charts can be displayed on one datawindow. The charts are built dynamically and adjust for the differences in minimum and maximum prices of different stocks. Custom components such as the railyard, timeline and store shelf components can be rapidly derived from the existing dw-eXtreme components. These component can be customized and delivered to you. See examples of these custom components here. All dw-eXtreme objects use data import datastores that load the visual datawindow components. These import datastores can also be used as the source for reporting purposes. None of the components connect to a database. All examples are run from flat files. You may source these from databases or files. When you purchase a dw-eXtreme datawindow component you get the component embedded in a demo application. Since the components are delivered as source code you are receiving examples of the advanced coding techniques used to create extreme datawindows. Developers can learn these techniques and apply them to there own development efforts and create other advanced datawindows. For instance the planner component is delivered with a datawindow based treeview in the demo application. The GNE and Org Chart components contains advanced drag and drop of graphical objects from one datawindow to another. The appointment object includes a datawindow based calendar object.